State House ignored questions about President Hage Geingob's exact role in the decision by the government to lease four farms to Russian billionaire Rashid Sardarov. The billionaire bought the farms near Dordabis south-east of Windhoek measuring a combined 17 000 hectares in September this year. He then donated them to the government, which in turn leased the farms to back to Sardarov from 2018 to 2117. Geingob's refusal to answer questions comes at a time when a media report accused the current administration of misleading and keeping the public in the dark about a document presented to a presidential-led Cabinet committee that said the four farms were worth N$207 million. That figure contradicts the N$43 million registered at the land reform ministry's Deeds Office as the price paid by Sardarov, which raises questions about possible tax avoidance - a scheme used by taxpayers to reduce their tax bill. Geingob has publicly remained tight-lipped on this transaction, amid an outcry about this deal. He has instead left it to his senior ministers to comment on the controversial deal. The Namibian emailed five detailed questions to presidential spokesperson Alfredo Hengari on 5 November 2018. The questions asked the head of state to explain his exact role in this transaction; whether he was briefed about the lease of the farms; and what his message was to the people who are unhappy about the deal. The other questions focused on whether he believes that this was a good deal for the country. Hengari confirmed that he received the questions a few days later, but he never answered. The Namibian followed up with two email reminders since last month, but the presidential spin doctor ignored them. Another reminder was sent to him over the weekend. The Patriot newspaper reported last Friday that Sardarov paid N$207 million for the four farms, and not N$43 million as claimed by land reform minister Utoni Nujoma. The newspaper relied on a document submitted by Nujoma to the Cabinet committee on overall policy and priorities in May this year. 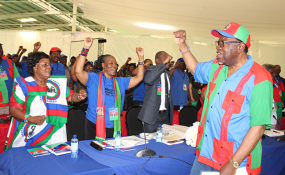 Geingob chairs that committee. According to the news report, the document stated that the Russian billionaire wanted to pay private farms owners N$207 million for the four farms, and donate N$24 million to the government. Sardarov promised to pay farm owners as follows: N$60,5 million for Farm Reinhof 123 (5027 hectares), N$71 million for Farm Kameelbook 119 (5917 hectares) and N$5 million for portion C of Farm Smaldeel 124 (457 hectares). The three farms were owned by Farm Rainhof Property Limited, whose directors are Manfred Josef Fritsch and Peter Gert van der Merwe. Sardarov also promised to buy Farm Wolfsgrund 122 (5982 hectares) that was owned by Kurt Duvel and Katrina Duvel for N$72 million. However, Sardarov only "paid N$43 million" for the four farms in September this year, instead of the N$207 million he was willing to pay in May 2018. The Russian was willing to pay N$255 million, including the N$24 million donation to the government. Questions remain on why the government opted to lease Sardarov the land for N$160 000 a year and rejected a N$24 million donation to benefit Namibia immediately. People familiar with this transaction have for months suspected foul play and possible tax avoidance. Rally for Democracy and Progress (RDP) parliamentarian Mike Kavekotora asked prime minister Saara Kuugongelwa-Amadhila in the National Assembly about suspected bribery in this transaction on Thursday. The RDP lawmaker asked the government to assure the public that N$25 million did not end up in somebody's pocket as part of the deal to allow Sardarov to buy and lease four farms near Dordabis. Deputy prime minister Netumbo Nandi-Ndaitwah, standing in for Kuugongelwa-Amadhila, answered Kavekotora's questions in parliament. "If the honourable member has any evidence to support the suspicions in the question, or if he has reasons to believe that someone was bribed, I wish to advise him to please approach the relevant institutions that are tasked to deal with cases of bribery, and provide the evidence," she said. One such institution is the Anti-Corruption Commission, she added. According to her, the government does not turn a blind eye on corruption. Asked whether there are similar farm deals with foreign landlords, Nandi-Ndaitwah said "there is no such information in the Office of the Prime Minister" or "anywhere in the government". Sardarov's Namibian lawyer, Sisa Namandje, told The Namibian yesterday that there is nothing new about the compensation of the farmers, except the "exaggerated and incorrect amount of N$207 million". "I have already indicated our first response to The Namibian, that the minister of land reform fixed the condition that government acquires the farms at a full cost of Sardarov," he said. Namandje added that Nujoma's condition of full cost includes the purchase price plus any compensation the farmers may demand. He referred The Namibian to the publicly available notarial lease agreement which states that Sardarov will pay the cost including compensation. "To us, it's nothing new," he said. Asked whether Sardarov deliberately paid N$43 million to avoid paying taxes to state coffers, Namandje said this was not the case, "at all". The lawyer said lawmaker Kavekotora is abusing his parliamentary privilege to slander people. "As a matter of fact, there is no evidence to that allegation. He would not say it if it were not parliament where he is hiding under parliamentary privilege. If he makes such unfounded allegations anywhere else, we will make him pay up to his last donkey," he said. Namandje added: "The fact is, this was a purely commercial transaction. No bribes were involved as insinuated". People familiar with this matter said Sardarov paid over N$100 million for the farms, in addition to the N$43 million recorded at the Deeds Office.